But almost six years later, growth at the world’s largest fast-fashion brand has slowed down a notch in India, as a shortage of new shopping malls makes it hard for Zara, which has more than 2,100 stores in 88 countries, to keep adding outlets in India. For the year ending March 31 2016, Zara’s revenue in India grew 17% to Rs842.57 crore, trailing the 24% growth reported a year earlier. During the year the retailer added only two locations, bringing its total store count in India to 18. “Plans are to open a few more Zara stores in India over the next three to four years in the major cities—the primary challenge to faster expansion is the availability of high-quality retail spaces which can be expected to generate reasonable sales throughput,” Trent Ltd, Zara’s joint venture partner in India and a part of the Tata Group, said in its annual report. India has one-tenth the mall space of the US, despite a population that’s four times larger, the consulting firm A.T. Kearney estimates. 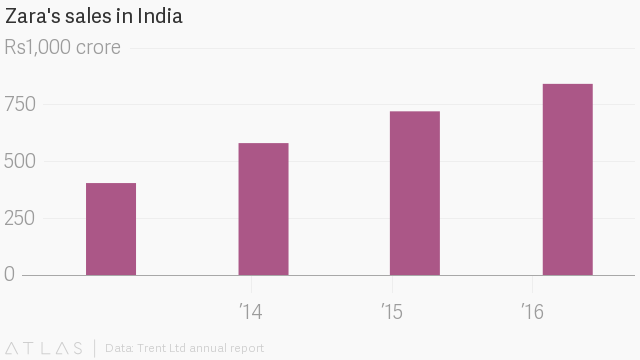 Investment in new malls in India has been slow since at least 2014, following a steep decline in the housing market. With its mall options limited, Zara has started looking at the high streets of Mumbai. In April, it took 50,000 square feet of space on the ground floor of a building across from HSBC’s India head office. The scarcity of good locations for mall-based expansion has coincided with the entry of other large foreign chains into the country. Many of the malls in India where Zara once enjoyed a monopoly in fast-fashion now host H&M, Aeropostale, and Gap, all of which entered the country in 2015. More recently, Forever21, another fast fashion retailer, found a new franchise partner in India, giving a boost to its growth prospects in the country. But amid the property market frustrations and new competition, there’s at least one bright spot in the India business for Zara. While “incremental growth is not happening because of lack of new store openings and options, in fact, Zara outperforms competition in per square sales foot sales,” says Pankaj Renjhen, managing director of retail services at real-estate consultancy Jones Lang LaSalle.